South Shore Furniture is a popular brand found in households all across America. They’re known for their innovative furniture designs and quality construction. This is furniture that can remain in your home for decades of use. Below you’ll find a collective review for three of South Shore’s popular collections, so you can hear what customers are saying about this trendy, long-lasting furniture to see if it’s right for your home. South Shore’s Summer Breeze Collection is a classic, modern favorite that customers love. The shipment arrives quickly and the new owners are pleased at how heavy and sturdy the Mates Bed is. Assembly is another plus; one couple said their 6yr old put together the drawers of the Double Dresser nearly by himself and that it took two adults just 2 hours to put together 2 Mates Beds. Customers are happy the bed works for young children’s “big kid” beds, as well as, a comfortable piece of furniture for one couple’s 200lb teen boy! The 5 Drawer Chest even passed the durability test of a 6yr old rowdy child who climbs and jumps all over his new furniture and everything is still in good shape. The design looks great and we hear the Denim Blue finish in particular really brings life to a bedroom. 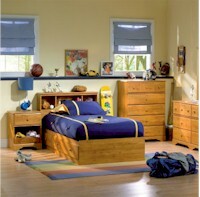 The simple, traditional South Shore Popular Collection fits with any child’s bedroom set-up or design. Customers have been very happy with the Bookcase Headboard and how great it looks with the child’s bed. One parent said it suits her child’s needs perfectly and that the piece of furniture was easy to assemble, not many tools were needed. The Loft Combo Storage Unit was put together easily by a single mom who used this piece behind her child’s twin bed instead of a headboard and was very pleased with the final look. A customer bought the Night Table for a 3 year-old child’s room saying it was extremely easy to put together, feels nice and sturdy and looks great with the rest of the set. South Shore’s Little Treasures Collection has a classic design that’s perfect for young kids. Customers are always telling us how heavy and well packed the Mates Bed Box comes and that it’s very easy to assemble. Once the bed is set up in the child’s bedroom, parents love how much extra storage the easy-gliding drawers within the bed frame provide and the design ensures kids can’t just shove everything under their bed! The 5 Drawer Chest is a favorite because it’s easy to set up and the nice design looks like realistic Country Pine in kid’s rooms. The Double Dresser is another option for storing cloths and customers say this piece of furniture is beautiful and very easy to put together. One customer said that although it recommends two people for assembly, they were able to set it up themselves.